Cloud computing and associate technologies are in high demand due to the radical shift to the adoption of cloud based technologies. Amazon Web Services (AWS) is most popular and market leader in the cloud computing service providers. If you look at the career opening with employers, there is a huge demand for the AWS and it became necessary for AWS developers to have certification to showcase their talent to their employers. AWS Certified Solutions Architect Associate certification exam is the most basic level / entry level exam offered by AWS certification program. Those who are willing to start their career in AWS, this certification is the ideal place to start the preparation. In this article, I am going to explain you how to prepare for this certification and what are the useful information available that can be used during your preparation. If you have any questions, please contact me for the clarification. You cannot pass this exam without the practical experience on using the Amazon Web Services (AWS) platform. It is not easy to afford this platform for everyone on their own, by luckily Amazon offers 1 year free account for the first time users. This free account offers you most of the services with limited usage. You can sign-up to this free tier account and start exploring the each services offered by Amazon. You have to start using the services like S3 (which is the online storage provided by Amazon to store the static files. You can even host the static website using S3 service, trust me, it is awesome to use S3), EC2 (processing speed for running your applications), etc. ● Certification Site: This is the starting point. This is the official certification site for Solutions Architect Associate exam. There is lot of information that has to be read before you start preparing for the certification. This link provides the basic information about this certification and advantages of this certification. ● Frequently Asked Questions (FAQs): This is one of the most useful section of the AWS certifications preparation. This section would help you to understand about each services. There is a FAQ section for each services. You have to go through each of them before attending the exam (Amazon FAQs). ● Exam Blueprint: Exam blue print is the syllabus and exam pattern document. This tells you what are the sections covered in the exam and pattern of the exam. This is the exam syllabus that will have to be prepared for the exam. 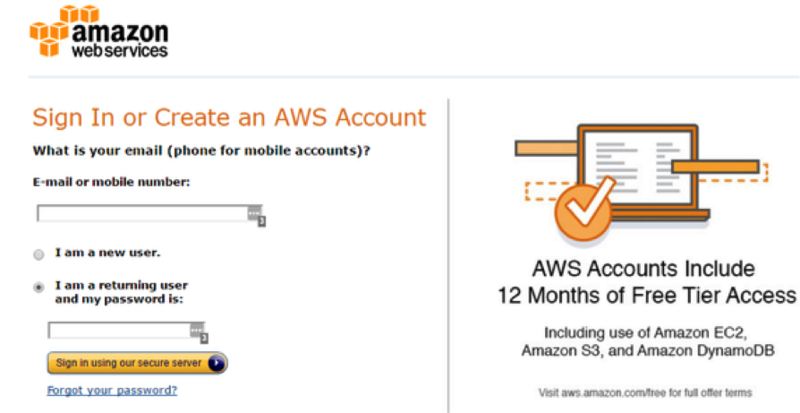 You can download it from here (AWS Solutions Architect Associate BluePrint). 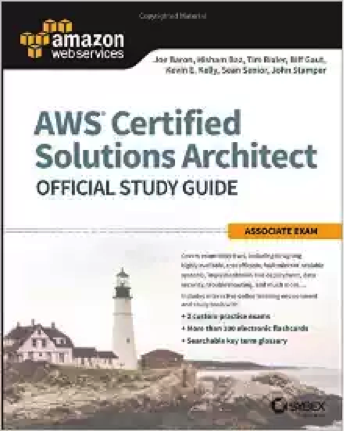 ● AWS Practice Questions: If you want to get the idea of how the real exam questions will look, you can download the free sample questions from the AWS certification page itself. Here is the link for sample questions. Here is the summary of exam information for Solutions Architect Associate certification exam. ● Passing Score : 65% (There is no guarantee that it is fixed. Amazon keeps changing the passing score) There is no negative mark in the exam. There is only one book available in the market for this exam and also there is no other books for other certifications as well as of writing this article. You can buy the official book released for the solutions architect associate certification exam. 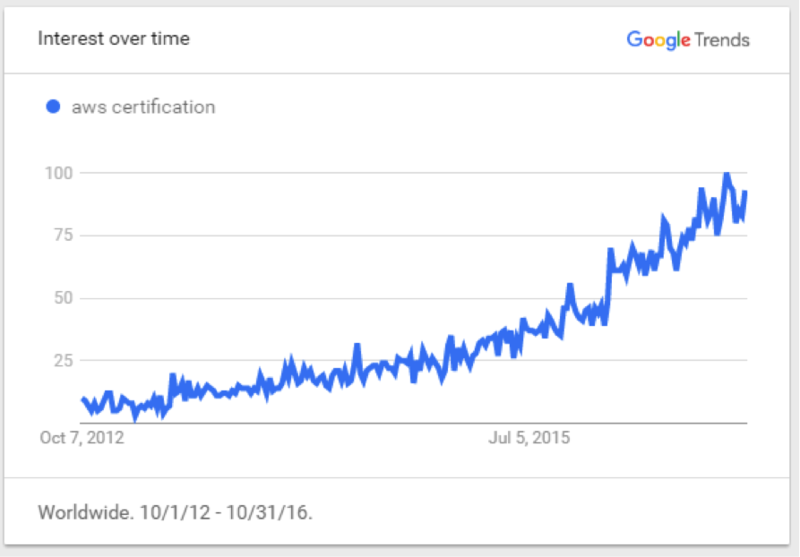 Who can take the AWS certification? There is a misconception that only technical background with programming skills can write the AWS certification exams. But, AWS certification exam will be suitable for non-technical background too. Having the programming skills are a added advantage because it is easy for you to trouble shoot the problems and you can understand the infrastructure. Anyone can write the AWS certification and have a successful career in AWS technology. Only requirement is to be more dedicated on learning various concepts about the cloud computing. There is quite number of services that has to be configured and used for implementing the AWS. 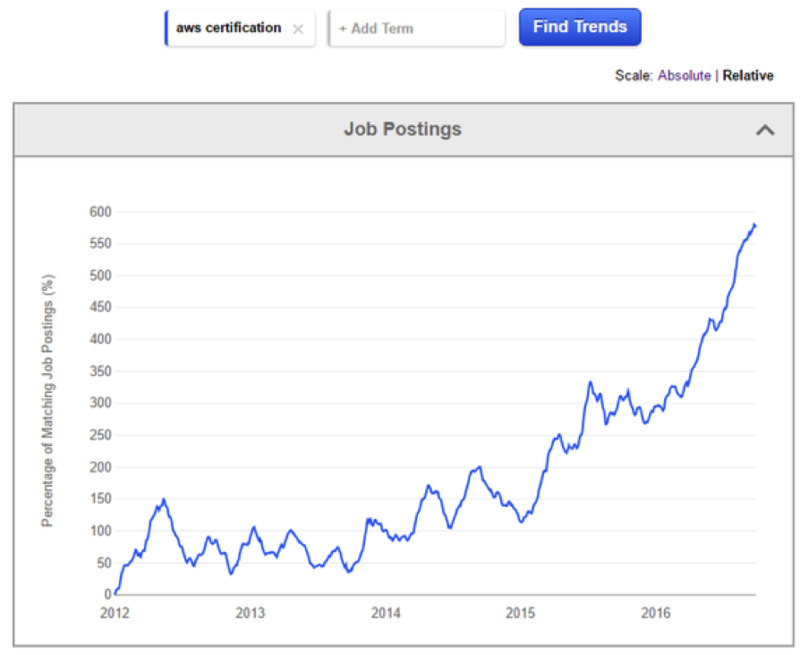 Here is the few snapshots that shows how AWS jobs are on the rise. There is huge demand for AWS jobs in the coming years. Look at the Google Trends and Indeed search engine for the AWS related keywords. This clearly shows that chart is going up over the years. Once you have gone through the white papers, official documentation offered by Amazon and books, it is time to try the practice questions. This is one of the most important step for gaining confidence for attending the real exam. There are various leading one exam simulators there for taking up the practice questions. I hope this article would help you to prepare for the AWS certification exam. If you are interested in start your career in cloud computing or Amazon Web Services (AWS), it is right time to start preparing for the AWS Certified Solutions Architect Associate certification exam. With 2 months of dedicated effort, you will be able to pass this certification. I will keep writing few more articles in Amazon Web Services in my next blog posts. Keep watching my blog and subscribe to receive the future updates.